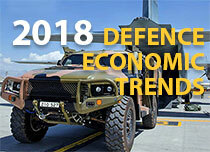 Welcome to the Defence Intelligence Organisation (DIO), where information from a range of sources both nationally and around the globe is transformed into reliable and incisive insights that help defend Australia and protect its interests. DIO is on the forefront of world-altering events – as they happen and sometimes even before they happen. I not only get to put my studies to practical use, I also get to work in a rewarding team environment with many exciting opportunities. I feel part of a really close-knit team and I'm continually learning from some of the smartest people in the country.